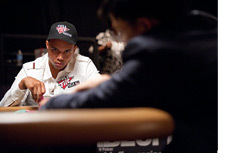 According to HighstakesDB.com, Phil Ivey is up nearly $20 million on Full Tilt Poker since January 1st, 2007. Ivey's mind-boggling $19.47 million in profits on FTP since the beginning of 2007 have come over a total of 288,265 tracked hands. This works out to a total profit of over $67 per hand for every hand that Phil has played on the site over the past 3 1/2 years. Ivey is likely well over $20 million in total profits since the beginning of 2007, but HighStakesDB only started tracking HORSE/Omaha Hi-Lo in July of 2008, and Mixed HA games in January of 2009. Considering that Phil has made approximately $10 million playing HORSE/Omaha Hi-Lo on FTP since July of 2008, it's probably pretty safe to assume that he was a winner in those games prior to then as well. In 2007, Ivey was the third most profitable player on Full Tilt Poker. In 2008, he was the most profitable player on Full Tilt Poker. In 2009, he was the second most profitable player on Full Tilt Poker. In 2010, he is the most profitable player on Full Tilt Poker after the first eight months of the year. Since the beginning of 2007, many names have made a splash in the high stakes games on Full Tilt Poker, only to get beaten back down. Names such as "martonas", "Isildur1" and "Kaibuxxe" all had their run-ins with Phil Ivey, usually getting the best of him in the beginning. In each case, Phil sat back, figured out their games and helped to send each of the three players packing from the high stakes tables on Full Tilt Poker. It's good to be Phil Ivey.